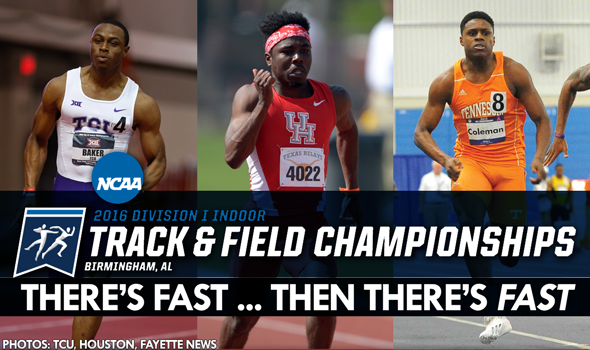 BIRMINGHAM, Ala. — The men’s 60-meter dash wasn’t supposed to be fast this year. At least that’s what collegiate track & field pundits would lead you to believe. After all, both Trayvon Brommel and Andre De Grasse left the NCAA system for the professional ranks. Well, those critics forgot about one key competitor — TCU’s Ronnie Baker, the man who won the NCAA title last year. Baker returned to the NCAA Division I Indoor Track & Field Championships on Saturday to defend his throne. He did just that in the fastest 60-meter final in history. In a race where the top-5 men went 6.60 or faster, Baker scorched the track en route to a winning time of 6.47. Baker broke the meet record and is now the third fastest collegian all-time behind Leonard Myles-Mills (6.45) and Marcus Brunson (6.46). “There’s a lot of pressure coming back the second year and trying to win the national title," Baker said. "I’m really happy I could come out here and run against some of the fastest guys in the nation and get it done." Houston’s Cameron Burrell, who ran the quickest time in Friday’s prelims (6.50), finished second in 6.48. That set another personal best and left him fourth on the all-time chart. "I went out there and gave it my all," Burrell said. "Sometimes you win, sometimes you lose — but 6.48, I’m OK with that." Rounding out the top-5 were Tennessee’s Christian Coleman (6.52), Oklahoma State’s John Teeters (6.53) and Arkansas’ Jarrion Lawson (6.60). Baker credited his win to a lesson he learned most recently in a winning effort at the Big 12 Championships. "In a lot of the other races, I’ve been kind of slowing down during the race and people were asking me, ‘How much do you have left in the tank,’" Baker said. "Just being able to run through the line this time obviously was great. I came out with a PR, the season’s best and I can’t begin to describe it."